A vintage Jaguar convertible, believed to be gone forever, is now being returned to its owner 46 years after thieves in New York drove off with it. Authorities recently found the car in a shipping freighter off the California coast, headed to Europe. "I couldn't believe it," said Ivan Schneider, the car's original owner. "I still don't believe it. It's a miracle." Schneider, 82, spoke to CBS News correspondent Bigad Shaban via video conference from his current home in Florida. Schneider says he still remembers the March morning in 1968 when he left his Manhattan apartment for work and couldn't find his then-6-month-old Jaguar XKE convertible. "I was heartbroken to say the least," Schneider said. "Never in anybody's lifetime did I think I'd see that car." 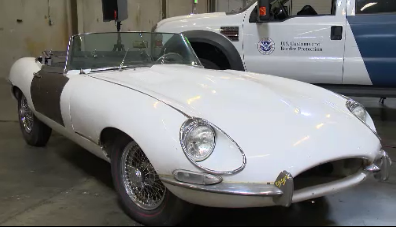 A routine customs check at the Port of Los Angeles last month helped identify the 1967 Jaguar as stolen. Investigator Michael Maleta with the California Highway Patrol has worked to locate stolen vehicles for the past 12 years, and helped recover the convertible. He says when Schneider last drove the car, it had 6,000 miles on it. Today, the odometer shows more than 28,000 miles. "Where has the car been all this time?" Shaban asked Maleta. "The current owner that was shipping it out, he sold it to a person in the Netherlands," Maleta replied. "I found out he had it for three months. He bought it from a person up in Turlock, [California], who had it for 40 years." Officials are still tracking down who may have stolen the car. While more paperwork needs to be completed before Schneider can officially take back ownership of the car, authorities say the vehicle could leave Los Angeles as early as this week. Before having the car shipped to his home in Florida, Schneider says he plans to send his long-lost ride back to New York to be refurbished so it can look just like it did when he last drove it more than four decades ago.